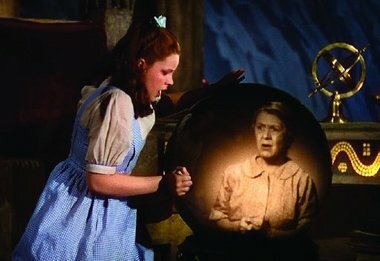 Remember Dorothy locked in the witch’s castle with the hourglass sand slipping away? She is afraid and cries for help. Suddenly Auntie Em appears in the crystal ball. She is calling for Dorothy but cannot quite seem to hear Dorothy shouting back to her. Dorothy places her hand against the glass exterior of the ball in a fruitless attempt to make contact. Of course the direct parallel is to Carol Ann trapped inside the TV. 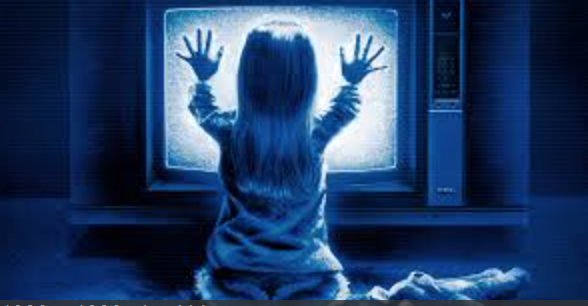 Carol Ann holds the palms of her hands up to the TV in the beginning with a gesture that evokes Dorothy’s; later in the film, the mother also puts her hand to TV trying to commune with her daughter trapped inside. See Always. The voracious tree outside the boy’s window is a far scarier hybrid of the human apple trees in OZ. See Minority Report, E.T. The first time we notice something is off about that tree is when the boy nervously observes it out his window. Normal things often take on surreal characteristics in Spielberg’s films when they are viewed through the window’s frame, a flashback to Dorothy’s peek into the tornado from her bedroom window. See Schindler’s List, Catch Me if You Can, Lost World of Jurassic Park, Empire of the Sun. At the beginning, you can find Steven’s bike-moment as a neighbor pedals frantically to Freelings’ house with an armful of beer for the game. Spielberg lays his claim to many a film by means of this bicycle ‘brand’: Munich, Adventures of Tintin, Amistad, 1941, Always, Super 8, War of the Worlds, Empire of the Sun, The Goonies, Sugarland Express, Jaws, Inner Space, Used Cars. Stormy weather, ominous as a Kansas sky, presages the craziness to come. See Twister, War of the Worlds, Close Encounters, The Color Purple, Joe vs. the Volcano, An American Tale, Amistad. The green smoke unfurling from TV-land is somewhat reminiscent of the Wicked Witch of the West’s sulfuric trail. Poor little Carol Ann is drawn to the brilliant light inside her closet. Danger awaits, but like Dorothy’s entrance to Munchkinland, the innocent child cannot resist such allure. Later Tangina is silhouetted against the dazzling light. 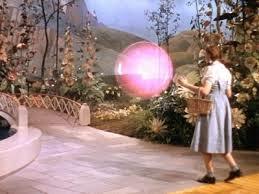 These shots imitate Dorothy’s silhouette as she crosses over the safety of her home’s threshold into OZ. See Close Encounters, Sugarland Express, Lincoln, Saving Private Ryan, 1941 for others who forsake safety to go to the light. A window blows in because of the storm. Uh-oh…that’s a Spielberg signpost that life is about to take a major detour. See Empire of the Sun, Catch Me if You Can, Hook, Twilight Zone the Movie Kick the can Episode, Joe Vs. the Volcano. A green tornado appears in the back yard. See Twister and Joe vs. the Volcano’s green typhoon. Cyclonic activity accompanies paranormal manifestations in the haunted bedroom. See Super 8, Twister, Raiders of the Lost Arc, War of the Worlds, Casper for more fun with rotation. Spirals are a very ancient archetype. When Carol Ann calls piteously to her mother, Diane shouts back, “We’re home. Can you find your way home?” See Twister, Close Encounters, Empire of the Sun, Catch me if You Can, Minority Report, The Color Purple, Munich, The Terminal, The Goonies, E.T., Amistad for home as sanctuary. See Empire of the Sun, A.I., Sugarland Express, Hook, Saving Private Ryan, War of the Worlds, Close Encounters, Catch me if You Can, The Color Purple, Indiana Jones and the Kingdom of the Crystal Skull, Jurassic Park (to Grampa) and WOO (to Auntie Em) for mother/child reunions. When the ghost-busters record the spirits on tape, the ghosts appear to float in lighted bubbles like Glinda’s. See Hook. When Steve first encounters Tangina, the medium, he quips “What side of the rainbow are we working tonight?”, an unabashed munchkin joke. See Inner Space, Always for more munchkin silliness. Note: I just re-watched this movie decades after last time I’d seen it…Zelda Rubinstein pulls off one of the eeriest performances of all time with such total integrity. Truly great! One could say the same for poor Margaret Hamilton. The clown’s striped arm curls around Robbie’s neck like the Wicked Witch of the East’s striped feet roll up when her ruby slippers come off. The name of the development is ‘Cuesta Verde’, a spoof implying the homes there cost a lot of green ($). See Sugarland Express for a town called ‘Val Verde’ and A.I. for one called ‘Rouge City’. Hmmm…does a rose by any other name smell…the same as Oz’s Emerald City? The last scene of the movie focuses on a neon Holiday Inn sign whose most dominant colors are red and yellow. See Duel, Indiana Jones and the Last Crusade, Indiana Jones and the Temple of Doom, Schindler’s List, Jaws, 1941, Joe vs. the Volcano, Twister, Inner Space, Jurassic Park, Used Cars, Sugarland Express, Memoirs of a Geisha. Both WOO’s makers and Spielberg share an affinity for the rainbow’s most dynamic duo.